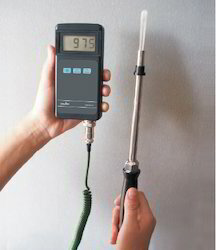 ACCURAD71 is a hand held digital thermometer equipped with a Pt-100 RTD temperature sensor. Radix also supplies a wide range of other probes for this instrument. Its temperature range is between -200° C and 700° C with a resolution of 0.1° C. It typically runs for 100 hours on its standard 9V battery. A large 3.5 digit LCD display shows your reading. The thermometer is accurate to within 0.6° C for temperatures ranging from -150° C to 199° C & within 2° C of temperatures between 200° C and 600° C.
ACCURAD71 indicates a temperature out of its range or a sensor-break with the number 1 on its display. HUMIRAD71 is accurate to within 0.3°C on temperature readings and 2% for humidity measurements. It receives input from Radix's SHT50 RH + T sensor, which must be ordered separately. HUMIRAD71's measures humidity from 0 to 100% and temperatures ranging between -20°C and 70°C with a resolution of 0.1 on both parameters. It typically runs for 100 hours on its standard 9V battery. A large 3-digit LCD display shows your reading. HUMIRAD71 is accurate to within 2% for humidity measurements and to within 0.3°C on temperature readings. The thermometer features no trimpots and is software calibrated. 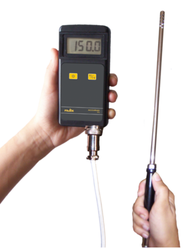 UNIRAD is a handheld universal digital thermometer, receiving input from 8 types of thermocouples (B, E, J, K, N, R, S, T), Pt200, Pt50 and Pt100 RTDs and a linear 0 - 50 mV voltage. 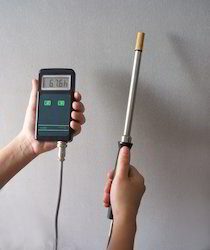 Radix supplies a wide range of probes to be used with this instrument. The temperature range handled by the thermometer is determined by the input received. Depending on the sensor used, UNIRAD can be used for applications measuring temperatures as low as -270°C and temperatures as high as 1760°C. It typically runs for 70 hours on its standard 9V battery. A large 4-digit LCD display shows your reading. Zero and span calibration is done through buttons on the front of the instrument. UNIRAD features a 1°C cold-junction temperature compensation UNIRAD indicates a temperature out of its range or a sensor-break with the number 1 on its display. Radix Handheld thermometers are small, portable devices for quick and effortless measurements. Choose ACCURAD71 for Pt100 inputs, DIGIRAD71 for thermocouples, HUMIRAD71 for RH+T measurement or UNIRAD, which has universal input. With a large variety of probes for different applications and long battery-lives of up to 100 hours, these handheld instruments are a must-have for any shop floor! For different options for the probes please click download button below. 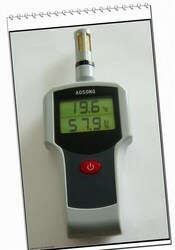 Looking for Handheld Thermometers ?